The history of Crystal Meth dates back to WWII. Immediately following World War II, Crystal Meth was extensively used to reduce fatigue and suppress appetite. Following the war era, Meth tablets, referred to as "work pills" were widely used in Japan. In the late 1960s, Crystal Meth became known as a dangerous drug that created substantial health threats to users, prompting the drug prevention slogan "speed kills". Concerns about growing rates of Crystal Meth use prompted the passage of the 1974 Drug Control Act, which drastically limited the medicinal usage of all amphetamines and virtually eliminated its large scale abuse. During the late 1970s and through the early 1980s, the problem of Crystal Meth use in the U.S. was, for the most part, limited to several California cities (e.g., San Francisco and San Diego), since the primary manufacturers and suppliers of Crystal Meth at the time were members of Hells Angels and other motorcycle gangs headquartered in California. 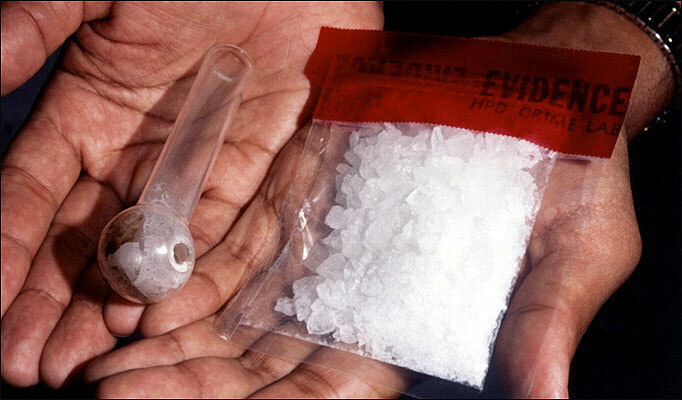 In the mid-1980s Crystal Meth use escalated dramatically in Honolulu as "ice", a smokable form of the drug that was imported onto the island of Oahu from the Philippines. Crystal Meth is not difficult to produce. During the history of Crystal Meth in the 1980s there was a rapid proliferation of large and small clandestine Crystal Meth laboratories in the southern desert areas of California, including San Diego, Riverside, and San Bernardino counties. Primary precursor chemicals commonly used for manufacturing Crystal Meth include: ephedrine or pseudoephedrine, hydrochloric or hydriotic acid, ether, and red phosphorus, which were readily available from numerous sources. Since there were few or no regulations on the purchase of these chemicals, the manufacturing of Crystal Meth was a rapidly growing cottage industry However, federal restrictions on the purchase of ephedrine in bulk during the early 1990s resulted in two major consequences for Crystal Meth production. First, there was a change in the "recipes" used to make Crystal Meth in the U.S., such that pseudoephedrine replaced ephedrine as the main chemical used in production. As a result of the switch to pseudoephedrine as a precursor chemical for the manufacturing of meth, pharmacies and convenience stores around the U.S. became unwitting suppliers of the Crystal Meth production effort, since pseudoephedrine is the active ingredient in many over-the-counter cold and sinus medicines (e.g., Sudafed and Nyquil). Federal and state regulations, as well as voluntary actions by many of the manufacturers of pseudoephedrine-containing medications, led to packaging modifications, giving rise to blister packaging of all products with pseudoephedrine, which are now sold in limited numbers. Because of the history of meth, some states have passed legislation that requires that all pseudoephedrine products are moved behind the sales counters in pharmacies and stores, further restricting access, although these political efforts have been slow. These strategies are believed to have increased the difficulty for Crystal Meth producers to acquire adequate supplies of pseudoephedrine without drawing the attention of retailers and consequently law enforcement officials. Secondly, there was a shift in Crystal Meth production-based markets from the U.S. to Mexico, where ephedrine was still available with few restrictions. The emergence of large-scale Crystal Meth production just south of the border in Mexico has had an unforeseen consequence. Mexican drug trafficking organizations with established routes, smuggling strategies, and highly trained personnel for transporting marijuana and heroin into the U.S. have added Crystal Meth to their "product line", which introduced Crystal Meth into medium-size cities in the western mountain region of the U.S. (e.g., Salt Lake City) and the Midwest (e.g., Des Moines). Expansion of Crystal Meth in these geographic areas has not only impacted the rising and spreading rates of meth-related drug disorders in the U.S., but also increased the power and impact of Mexican trafficking organizations and their ability to subsequently further extend their commerce with Crystal Meth into the Southeastern U.S. The monitoring youth survey showed that 4.5% of high school students said they have used the crystal meth at least once in their life. Meth addiction can result in brain damage, fatal kidney and lung disorders, liver damage, chronic depression, paranoia and other physical and mental disorders. When a person takes an overdose of meth they will have a high temperature, kidney failure and cardiovascular collapse. All of these symptoms will take place very quickly. Meth users who binge on the drug smoke or inject it and for euphoric rushes which are highly addictive. There are many catastrophic accidents that are associated with the illegal manufacturing of crystal meth. There have been reported cases such as automobile accidents, explosions and fires triggered by the illegal manufacturing of crystal meth. There is also the possibility of environmental contamination that may be the result of in appropriate disposal of waste material used in the process of manufacturing the crystal meth.